Experiments in Motion, a collaborative research initiative conducted by Audi of America and Columbia University GSAPP, focused on rethinking the relationship between motion, mobility and design. A dinner, which fittingly incorporated motion into its design and seating arrangement, created a think tank environment to kickstart the interdisciplinary discussion and program. 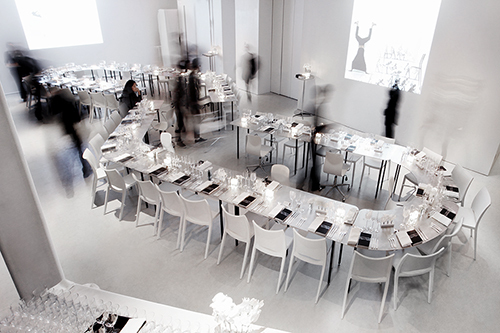 A modular table, created for the launch dinner through a collaboration between the Laboratory for Applied Business Sciences, C-Lab and Studio X of Columbia University GSAPP, was designed to allow it to transform and reconfigure for future events. In its configuration here, the table accommodated 60 people around its exterior with the interior seating an additional 12 people on moving seats. The table's ability to rearrange seating over the course of the meal both encouraged and facilitated a constantly evolving discussion that laid the foundation for the program and future events. Likewise, the table's reconfigurable modularity allowed Experiments in Motion to build upon the idea of discussions in motion and initiate roundtable events such as the January 30th, 2012 studio launch on Architecture in Motion.